AleaSoft, March 21, 2019. 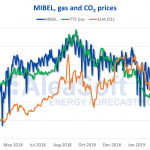 This week the electricity market MIBEL, although its prices have decreased compared to last week, has begun the spring in the high price strip of Europe, according to the analysis conducted by AleaSoft. 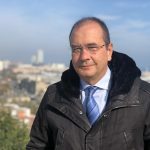 The Iberian electricity market MIBEL has started the spring among the highest priced markets in Europe, as it is been happening since the last days of winter. According to the analysis carried out by AleaSoft, today March 21 registered the highest daily average price among the main markets of the continent, 52.53 €/MWh for Portugal and 52.43 €/MWh for Spain, followed closely by the Italian IPEX market and the British N2EX market, with 51.40 €/MWh and 51.36 €/MWh respectively. Still, in the first four days of this week, from March 18 to 21, the price of the MIBEL market dropped by about 0.8% compared to the first four days of last week. When analyzing all the European markets, the three price strips mentioned in previous analyzes of AleaSoft can still be seen. In the highest strip, with prices between 50 €/MWh and 60 €/MWh, there are the IPEX market and the N2EX market. In the middle strip, with prices between 45 €/MWh and 50 €/MWh, the MIBEL market is located, although as mentioned above, on March 21 it was located in the highest strip. 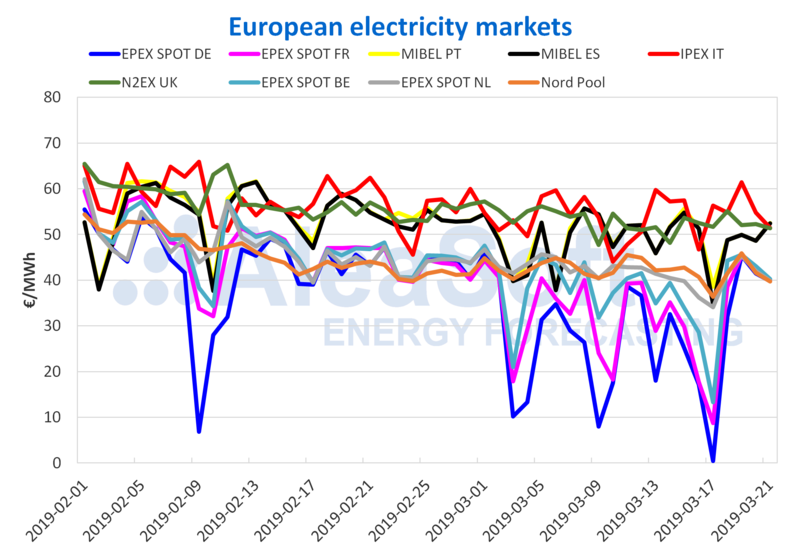 And in the lowest price strip, between 40 €/MWh and 45 €/MWh, there are the EPEX SPOT markets of Germany, France, Belgium and Netherlands and the Nordic Nord Pool market, which this week have been very aligned. The Brent oil futures for May 2019 in the ICE market settled yesterday at 68.50 $/bbl, a value not reached since mid-November of last year. Yesterday, March 20, a report of the EIA (U.S. Energy Information Administration) was published, reporting a decrease in crude inventories in the United States, which, together with the OPEC production cuts, have favoured the bullish sentiment of the market. The futures of TTF gas and API 2 coal for April 2019, both in the ICE market, have continued this week with the downward trend they have been experiencing since the end of September last year. 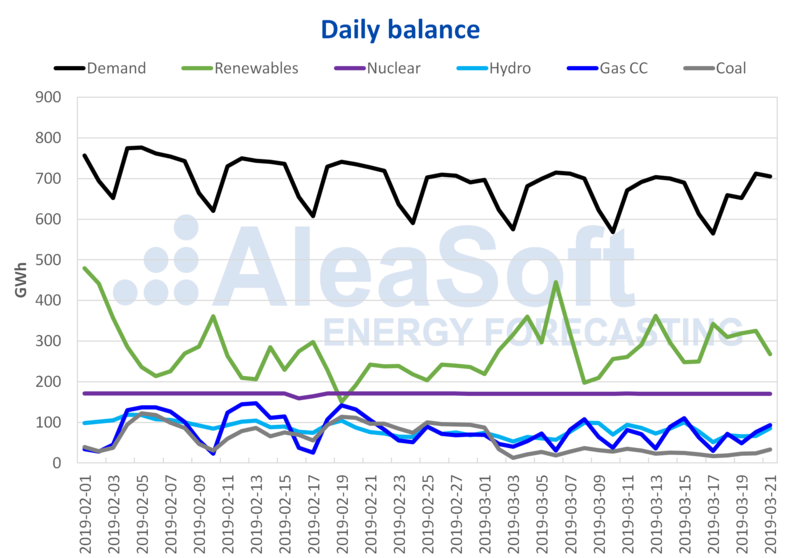 This trend should be maintained in the coming days, with the arrival of spring and the associated decrease in electricity demand, as noted by AleaSoft in previous reports. On Monday, March 18, the TTF gas futures for April 2019 settled below 15 €/MWh, at 14.98 €/MWh, a value that had not been reached in the last two years of trading. The API 2 coal futures for April on Tuesday, March 19, settled at 68.65 $/t, a value that was not reached since the end of July 2017. This week, from March 18, the futures of CO2 emission rights for the reference contract of December 2019 in the EEX market have dropped from 22 €/MWh for the first time this month, reaching down to 21.12 €/MWh on Tuesday, March 19. In AleaSoft, the price is expected to remain close to the equilibrium value of 22 €/MWh, with a tendency to fall to 20 €/MWh. This week is being prominent in generalized falls for the European electricity futures markets, following the general trend of gas and coal prices, and a stable and smooth CO2 price. The price falls are noticed more in the closest contracts, for April and for Q2 of this year, while the longer term contracts, for Cal‑20, even having decreased with respect to the previous week, are stable or rising in price so far this week. The Spanish electricity future for April has fallen by 3.4% since the end of last week, Friday March 15, in the OMIP market, and settled at 47.48 €/MWh on Wednesday, March 20, being the lowest price of the last six months, practically since its trading began. The future for the second quarter has also dropped by 4.1% since the end of last week, to 49.63 €/MWh on March 20, in this case the lowest value in the last nine months. For its part, the future for the year 2020 hit bottom on Monday, March 18, with 53.00 €/MWh, the lowest value in the last eight months, but it rose to 53.33 €/MWh on Wednesday, March 20. Similar values ​​and behaviours occurred in the EEX market, with slightly lower prices for the Spanish futures. The futures for Portugal in the OMIP market have followed the same trend as the Spanish this week. The fall of the future for April has also been 3.4%, and was higher than Spain for the future of the second quarter, of 4.9%. The value of the future for the year 2020 also touched bottom on Monday, March 18, at 53.03 €/MWh, the lowest price in the last eight months. The electricity futures of France and Germany in the EEX market followed the same guidelines as the Iberian futures. For both countries, the price of the future for April in the session of March 20 was the lowest since the products are traded in EEX. In the case of the future for Q2, the records of low prices extend to ten months for France and eight months for Germany. This week of March 18 the average temperature in Spain is being lower than the previous week and, in the first three days of the week, the electricity demand of Spain was 2.5% lower than in the same days of last week. The main cause for this decrease is that on March 19 it was a holiday in some regions of Spain. According to the modelling made by AleaSoft, after correcting the effect of the holiday, the decrease would be around 0.5%. So far this week, in Spain the wind energy production has increased by 22% compared to last week. For the next week AleaSoft’s forecasts indicate that production with this technology will be similar to that of this week, with a slight tendency to decrease. The solar energy production, which includes photovoltaic and solar thermal, has decreased 13% this week compared to the average values ​​of last week. For the next week, in AleaSoft is estimated that it will remain at similar values ​​to this week, with a tendency to increase. This week all the Spanish nuclear power plants continue operating normally and the hydroelectric production has been around 66 GWh per day. According to the latest Hydrological Bulletin published by the Ministry for Ecological Transition, hydroelectric reserves decreased slightly in the last week, by 14 GWh, currently standing at 11 337 GWh, which represents 49% of the total capacity.